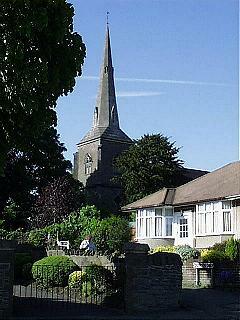 At the beginning of the 19th century, Fishponds had no place of worship though it was part of the Anglican parish of Holy Trinity, Stapleton. In 1806, the Anglican Church bought an acre of land near the Lower Fishpond, to be used as an overflow to Stapleton churchyard and it was decided, in 1820, to build a Chapel of Ease to the Parish Church on this same land, chiefly to accommodate those who were housed in the Fishponds Workhouse. 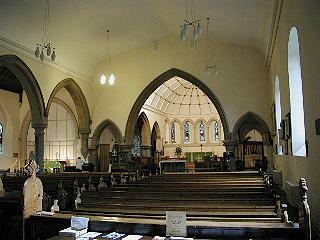 It was called Trinity Chapel, and was consecrated on 31st August 1821. At that time, it consisted of a rectangular nave to seat about 550, with a gallery at the west end for 142, including children and 'cello to lead the singing. At the east end was a tiny chancel and three-decker pulpit The entrance with porch was in the south wall of the nave. By the 1860s, the population of Fishponds had increased considerably and it was formed into a parish in its own right on 14th December 1869, Trinity Chapel then becoming the Parish Church of St Mary (the Virgin). The tiny chancel was demolished and replaced by a much larger chancel and sanctuary with choir stalls, the width of the nave, an organ being installed in the same area. There is also a tower and spire at the west end with main west doors. The gallery and south porch were demolished and the south door blocked up. The north aisle and sacristy were added in 1902, the former having an altar dedicated to St Aidan. A choir vestry was built on to the sacristy in 1927. A chapel dedicated to St Nicholas was created on the south side of the church and here the Blessed Sacrament is reserved. 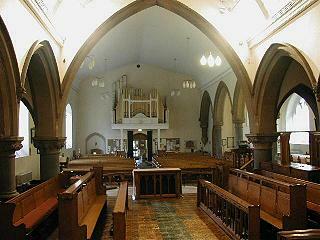 The organ became electronic in 1939 and the pipes were moved to the west end of the church. The choir vestry was destroyed by arsonists on the night of 17th/18th December 1992 and, on rebuilding, became a parish room with a second parish room built above the sacristy. The north west corner of the church was then made into the choir vestry. See the Fishponds Local History Society web site (from which this article has been copied, and which is believed to have been contributed by Phil Draper), here.